Not only does this taste great and light, but it is very healthy and loaded with fiber and nutrients! This tastes best when made ahead of time and it is best the next day. Below are a few things you could add to this to make it even better! Put lentils in medium pot and cover with water. Cook for 15-20 minutes until lentils are tender. Strain water and put into a large salad bowl. In same pot, saute carrots, celery, thyme, bay leaf, garlic and white parts of green onions until tender and transparent. 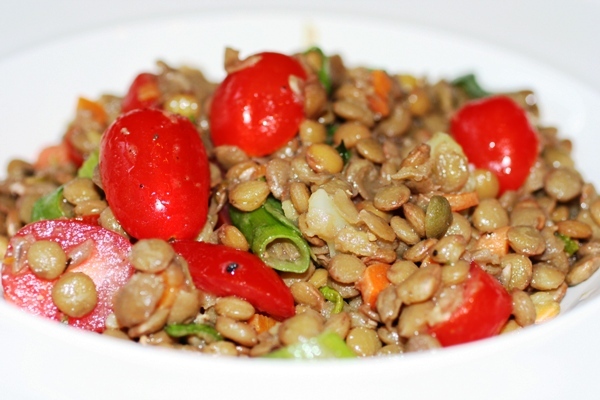 Add sauteed vegetables to lentils, tomatoes, and salt and pepper. Toss with Red Wine Vinaigrette to taste. Mix the vinegar, lemon juice, honey, salt, and pepper in a blender. Then gradually blend in the oil. Season the vinaigrette, to taste, with more salt and pepper, if desired. This looks great and I have all the ingredients so I think I will make it today to use as a side for dinner tomorrow. Made this over the weekend and added grilled chicken and a little Parmesan cheese. It was fantastic! We’re eating it for lunches this week. let me know if you decide to have personal recipe boxes to save the recipes from this site. I like to try before I print . Thanks for the great selection of meatless main dishes. I like the variety. You can create your own personal recipe box on the site. This post hasn’t added the functionality yet, but we’ll get to it!